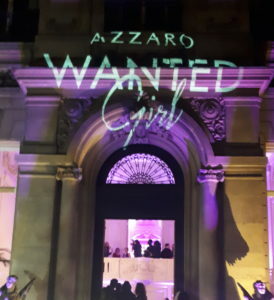 On Friday, March 29, 2019, the prestigious Hotel Salomon de Rothschild in Paris hosted the launching party for the Azzaro’s new Wanted Girl fragrance. 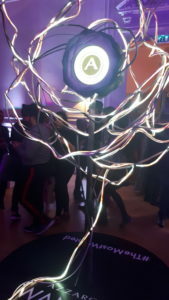 An exceptional party, which gathered for the occasion some French personalities. Under the precious woodwork and moldings of this edifice under a purple rain, just a few steps away from the Place de l’Etoile, which lends itself to all fantasies, was holding a very special ceremony. 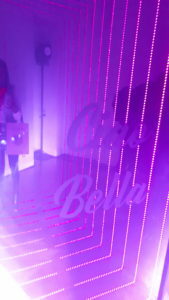 Each room was dedicated to the magic universe of the Azzaro imaginary, mixed of rose and purple. 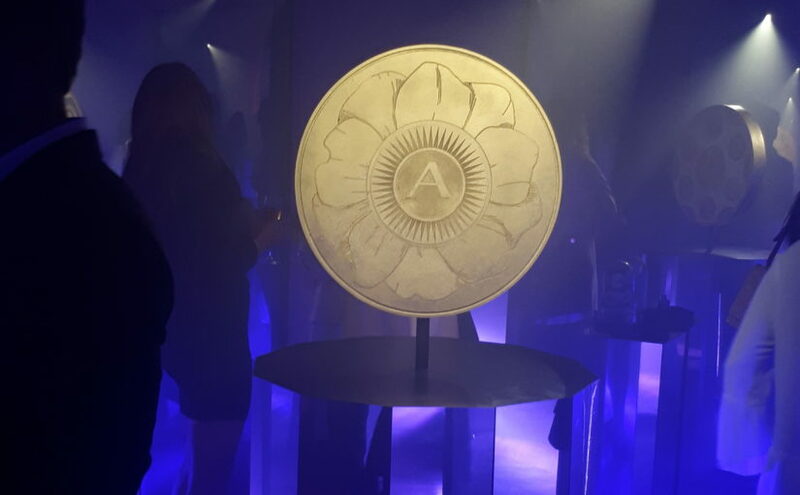 Added to this particular staging, a careful storage of worked decorative elements, in the effigy of games of light and shades, like this giant Azzaro coin, used in the perfume advertisements as a stacking game. Those items would be found in and around the palace, like the “treasure room”, where some stylized accessories of the brand were exposed around the circular golden totem which enthroned in majesty, in the center of this lookalike temple, to the glory of beauty and glamour. This Hotel Salomon De Rothschild is a major architectural parisian palace hosting a Curiosity Cabinet (check the article) and many highquality events (photo credits: Alexandre Plateaux). The muses of this new perfume, the models Georgia Fowler and the danish Nikolai Danielsen took the time to pose for the photographers along the evening. 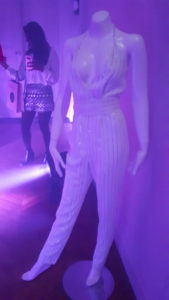 That was a like a festive outcome for them after the shooting of the commercial, they acted for in the sunny Grand Hôtel in Saint-Jean-Cap-Ferrat resort, located in the french Riviera, with of course the mediterranean sea in the background. 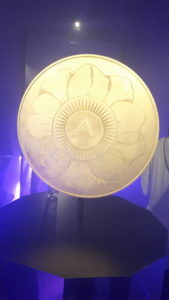 On a synopsis made of Instagram posts battles, crazy on golden trolley inside this hotel and even angel jumps in the pool, a real dual between the yin and the yang, both doing their best to stand out to designate who is the #TheMostWanted (photo credits: Azzaro). 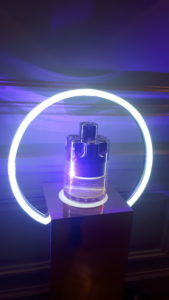 This new Azzaro Wanted Girl perfume is an oriental and floral fragrance, created by Fanny Bal, Dominique Ropion, Loc Dong and Jean-Christophe Berault. 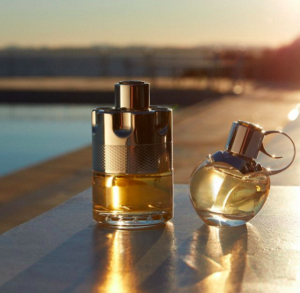 It includes scents made of ginger flower, orange flower, pomegranate pink pepper, reinforced by datura and finalized by patchouli, haitian vetiver and tonka bean. This giving a fully feminine and fresh cocktail for dynamic and modern girls, since the flacon has the shape of a floral grenade, where we can distinguish the petals of a flower… This device, surmounted by a medallion adorned with Azzaro‘s golden blazon, holds a gun trigger to broadcast the assets of the juice, ready to disband at any desire, like a perfume explosion. Mind the side effects of the shooting (photo credits: Azzaro)! 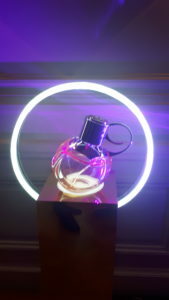 Following the continuity of the Wanted perfume saga, in the register of the “weapons of seduction”. 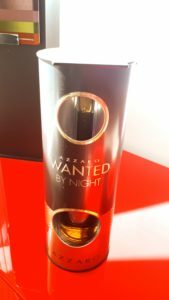 Indeed, the previous versions of the Wanted bottles for men, proudly sported the cartridges of a barrel of a gun, in a show of power that both are both sensual and virile, we invite you to discover these two other scents unveiled in 2016 for the Wanted version and 2018 for Wanted By Night, the night side and in fact more shady and mysterious. 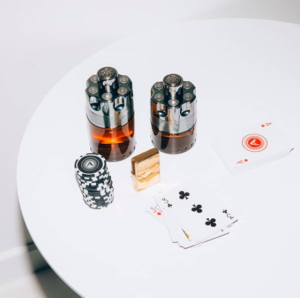 The first Wanted, gives a fresh sensation, composed of cardamom freshness from Guatemala and a woody Haitian vetiver, like the Wanted Girl plus a lemon touch. 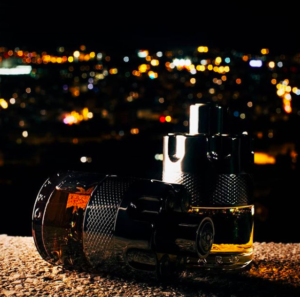 The second, with the same bottle in darker mood, thanks to the lacquered and chromed anthracite coating, supplanted by the irreplaceable brass Azzaro medallions, offers a night warmth, helped by an oriental agreement between red cedar, honeyed tobacco and of course cinnamon. Those are also available in different gift sets. 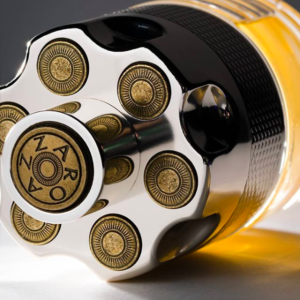 More information, visuals and order at the video below and on the official Azzaro website.